The GT-10 replaced the GT-8. But is the GT-10 that much better? or are we comparing it with a pile of rubbish (the GT-8)? Is it worthy of being in your armoury of equipment? Would you put your name on this effects unit? The GT-10 was something I approached with some trepidation, after all, I've been here before many times over the years. Sure enough, the product looks cool, but so did the GT-8 which had it's problems - so much so that I eventually sold it on eBay. But I thought ok, they have got some things wrong once, and I had bought the VG99 which the GT-10 is supposed to be based on so what the heck... Over the years I've had many different versions of the GT-10 i.e. the GT-5, the GT-6, the GT-8 (whatever happened to 7) and of course this one I have played with for a while, the GT-10. Like all of the other Boss kit this is built for the road (but wait and see about that) and is as well made a piece of kit that you can buy - of that there is no question. On this latest version - the GT-10 they have continued along the lines of easy to use, which was originally introduced on the GT-6. As well as this they now have something easy to use too - just get a sound by tweaking the knobs - very easy to get the sound you want and to apply effects of which (like all the GT range) are many. This interface works for me -actually it's too easy :-) so most guitarists will get on with that fine. I have often wondered why these manufacturers assume all guitarists are stupid - hey, come on, the GT-8 was easy to use, but this GT-10 has moved on to idiot simple! Maybe someone should tell them about their aspersions that Guitarists are stupid! 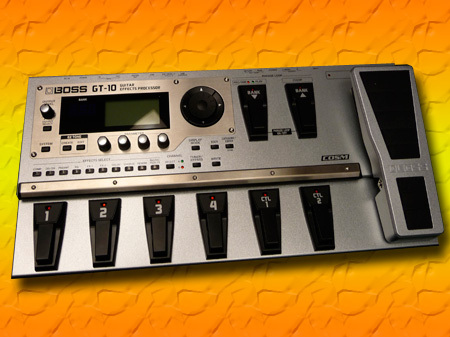 Like other reviews Ill cover some of the good bits: The GT-10 is based on the sounds from the VG-99 they say. It's a fact. I also own a VG-99 and that is probably one of the finest sounding pieces of equipment I have ever owned and used. The GT-10 is also no exception - the sounds are awesome. There I've said it - the sounds are awesome! The emulations are just about as real as you can get - and I can tell you that if you were blindfolded and we did a test against a real amp and this then you might just be hard pressed to tell the difference. With the VG-99 you would not be able to even tell anything, the guitar, the amp, the speakers etc... well I guess you get the picture. Oh and there's one last thing, if you have read my review of the GT-8 you will know that I could not make it switch an Engl E670 no matter how I tried. Roland support (in the UK) said it was not their pedal, and Engl (in Germany) said it was not their amp - there lies the problem - no one wanted to know... and as for the shop - forget it. However, I connected the GT-10 to the amp just to confirm it was me getting it wrong all along (as Roland support said) and hey presto - the GT-10 worked first time - well fancy that. The GT-10 IS a very good product there is no doubt - and every time they issue a new one - the new one makes things work better, but I thought that's what you paid for in the first place? No matter - this one works. Obviously in a review I could go on all day about the niceties of the unit until I go blue in the face - but the fact remains that this is not similar at all to the GT-8 - this one works. The speaker emulator remains capable of being turned off - good if you want to use it on a real amp - and I suspect most will, unless you're a bedroom player, then out come the headphones so everyone can get some sleep. The Question as on every other Pedal I have reviewed to date is: Does it allow me to sell my regular amp and cab? The answer is it fails that hurdle miserably - but if you really wanted to sell your amp and cab then buy a VG-99 - trust me it IS awesome. This GT-10 when I bought it cost about £350.00 pounds in the UK but has probably dropped in price since. Funny thing is, once again - I sold it. What is it with this Roland kit? I still have the GT-99 however, so I can't be sure if the GT-8 screwed it for me with all that agro previously. 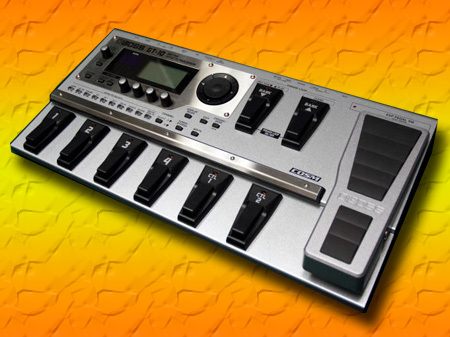 Great MIDI Controller that works!